1 Deep fry the canton noodles until crispy and set aside. 2 Sauté in wok puree of ginger and garlic, flambé with Chinese wine, chicken and all vegetables. 3 Add in chicken stock, salt and chicken powder. Allow to boil then thicken with dissolved cornstarch. Simmer for a while. 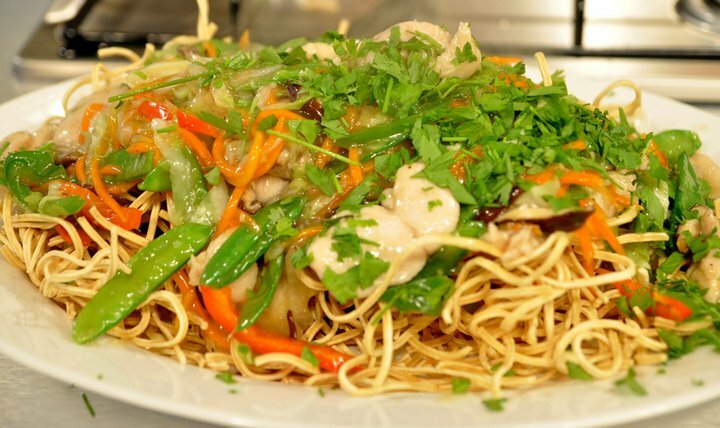 4 Bed plates with crispy noodles over the top with stir fry chicken and vegetables. Garnish with kinchay and spring onion.